If you’ve been following along with our four-part video series with Moving with the Military, then you know that we’ve been offering Lincoln Military Housing residents tips and tricks for decorating on a budget. The first video provided lots of helpful hints for transforming your entryway into a place that you love to see as soon as you step through the front door, and they all cost nearly nothing to achieve. In case you missed the full video, here are some of the key points. · Layer door mats. Instead of using just one simple door mat for your guests to wipe their feet on, add some extra texture by layering a traditional fiber door mat over a woven rug in a fun pattern. · Make your own blanket ladder. Using affordable planks of wood from your local home improvement store, make a rustic ladder to hang blankets on in your entry. Stain the wood any shade you like to create a custom effect. · Hang baskets in place of a wreath. If you’re looking for a unique alternative to the traditional doorway wreath, hang a flat basket from a nail hook on the front door. You can even attach some fall florals or other natural materials to the basket itself. 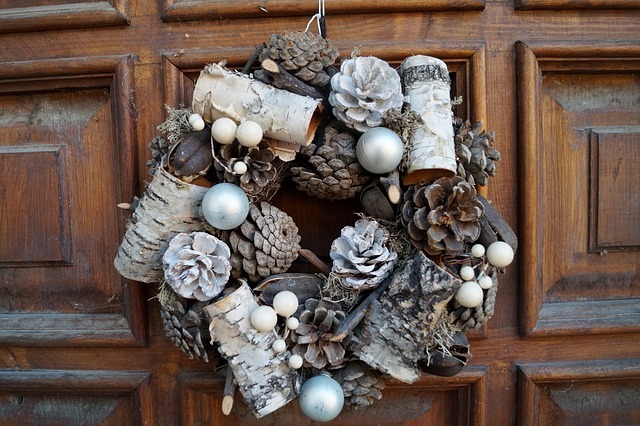 · Hang useful or decorative items behind the front door. Even if you don’t have the space for a coat rack, you can dress up the empty area behind your front door (and make it a bit more useful). Hang a “command center” that includes a bulletin board, hooks for keys and space for family photos, or add a mirror for last-minute hair checks as you run out the door. · Add a sofa table on a bare hallway wall. If you have a hallway or other empty area near the front door, add a long, narrow table where you can place a lamp or vase of flowers to greet guests. Place baskets underneath where you can store shoes and umbrellas, then finish it off with a colorful painting on top.